We’re closing in on six year’s since we last got to see Danny Trejo as his ultimate alter ego Machete on the big screen. So far, there have been two movies and a couple of appearances in the Spy Kids sequels. We’ve long been promised a third movie with Machete Kills Again… in Space. But there hasn’t been any apparent movement on that sci-fi action epic. Or has there? Danny Trejo recently gave an update on the Machete franchise. And believe it or not, he claims Robert Rodriguez is still going to make this movie happen. He wants it, Danny wants it, and the fans certainly want it. Danny had this to say about the impending sequel. Machete first appeared in the Spy Kids movies as Uncle Machete. He was then featured in a faux-trailer that played in front of Robert Rodruigez’s Planet Terror portion of Grind House. That trailer, which sold Machete as an old exploitation movie from the 70s, was so popular, it got spun off into a real movie. The first Machete arrived in 2010. And it can be described as unbelievably crazy. Machete Kills went beyond that. It was absolutely insane. So much so, it turned away some filmgoers while going onto reach ultimate cult status. 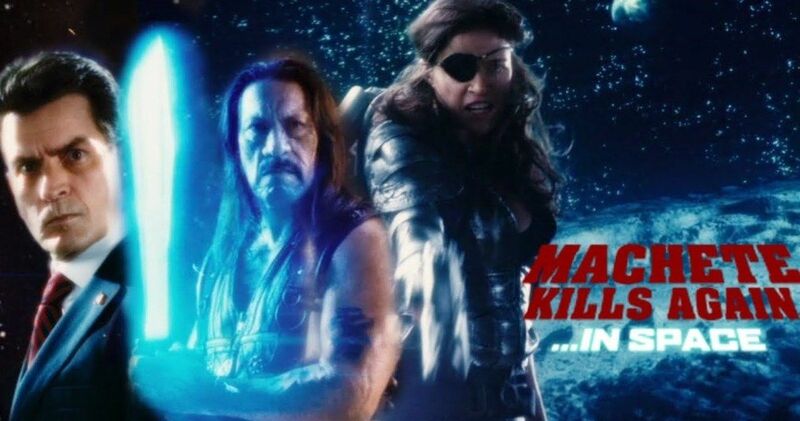 Whatever is being planned for Machete Kills in Space is sure to take the conceit and stretch it in unimaginable ways. It won’t be a tame steak, that’s for sure. Danny Trejo has been teasing Machete Kills in Space for years, which also got its own faux-trailer at the very end of Machete Kills. So far, neither Rodriguez nor Trejo have been able to deliver on the promise. Despite that, both have continued to keep hope alive for the sequel. Which will obviously shoot Machete out into the far reaches of space in an ode to that much maligned yet somewhat beloved 007 adventure Moonraker, which saw James Bond and Jaws fighting on a space shuttle wrapped in space suits that looked like they were made out of tin foil. Maybe Robert Rodriguez can convince Michael Shannon to take on the role of Jaws, complete with metal teeth to fight Danny Trejo as his ultimate nemesis. Or some variation on that concept. Danny Trejo appeared on an episode of Popcorn Talk‘s ‘I Could Never Be’, where he gave this Machete update. He further went onto say this about when we might actually see Machete 3, which doesn’t sound like it’s right around the corner. Robert Rodriguez is currently putting the finishing touches on his latest directorial effort Alita: Battle Angel, which has been a longtime passion project of James Cameron, who will serve as a producer. The movie was supposed to arrive in time for this Christmas, but it has been pushed to early 2019. There is no set release for Machete Kills in Space. So who knows when that will actually happen.